Were you looking for the Wizard skill Archon rune effect Teleport? A Wizard in her pre-teleport jump. Teleport is a Defensive Wizard skill unlocked at Level 22, allowing the caster to instantly transport herself a short distance through the air. This skill moves the Wizard over obstacles that can not be run past or around, including walls, closed gates, open pits or gaps in the floor, and more. It is highly useful to avoid dangerous Elite modifier effects, such as Waller and Jailer. This skill is the Wizard's movement ability and is of such utility that every Wizard build considers some form of this skill essential. The Teleport skill is a way for trained magic users to traverse the Ether - and with the speed of thought - materialize in another location a short distance from the entry point. This skill works without the aid of external gateways like the Town Portal spell or Waypoints, but is likely using similar techniques. The Teleport spell is only reliable over short distances, to jump gaps, or to escape immediate danger. It's unknown why the spell is only usable for short distance travel, but the likely scenario is that it becomes significantly harder for the caster to return to the Physical realm, the farther away they try to re-emerge. The beacon-like gateways of Waypoints and Town Portal spells may address this problem, thus allowing longer travel distances. Refer to the Teleport rune effects article for thorough descriptions of all five rune effects in this skill, including screenshots, videos, strategy tips, and other related information. Teleport has been seen in videos, and was testable for the first time in the PvP Arena demo at Blizzcon 2010. The main difference in the Diablo III version (compared to the Diablo II version) is in the character animation. In the new version, the Wizard leaps up into the air when casting it, appears in the air at the location she targets the skill, and falls to the ground after she appears. This makes the spell less of an instant escape/movement option. Just in case that wasn't clear enough, the developers have added a fairly lengthy cooldown to the skill. They seem to be serious about not letting Teleport be the queen of all fast moving, item run spells. However, the spell can be used offensively with the addition of skill runes. In one of the BlizzCon 2008 panels, Teleport was demonstrated with a striking skill rune socketed in it. With the rune, the spell was given an offensive component, dealing damage to all monsters in the area to which the wizard teleported. Socketing in a Hydra Rune (former name: Multi Strike) would instead cause the Wizard to split into images of herself when teleporting, making the skill useful to distract monsters, just like Mirror Image. The names of the skill runes have since been changed and it is unknown whether similiar rune effects for Teleport have been retained. Each class has been given at least one movement ability with a unique design/feel. Teleport is the most powerful of these in terms of where and how and how quickly it can move. The drawback is the cooldown time between uses. A video of Teleport can be seen below, courtesy of the DiabloInc You Tube channel. Teleport was first shown at BlizzCon 2008 when the Wizard debuted. Back then, it was at Tier IV in the Arcane Skill Tree and wasn't playable in the demo. When Teleport was seen in the BlizzCon 2009 demo, it had a greatly increased range (from 40 to 100 feet), a slightly lowered mana cost, and had been moved to Tier VI. Again, however, it wasn't playable. Teleport was fun to use, and I was surprised at how quick it was. 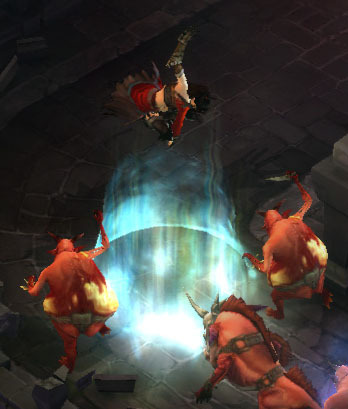 I’d thought with the new Diablo III animation—where the Wizard leaps up into the air before vanishing, and appears in mid-air and drops to earth on the other end—that it would be kind of slow. Not noticeable. Teleport felt as instantaneous as the Teleport in Diablo II. The delay was from the cooldown, which was around 8 seconds. This effectively turned Teleport into an emergency escape skill, one that was great during the busy scramble of an early round, but one that wasn’t so useful late game, if you were outnumbered and being hunted down. Skill tiers were removed for the July 2011 Press Event, allowing skills to unlock steadily from levels 1 to 30. Consequently, all skill levels were adjusted and Teleport became a level 18 skill. Hands down, Teleport is still king of the movement skills. It was never more evident during the match when you wanted to get away from a group of opponents. You could Teleport twice to get out of sight, then turn left or right and lose almost any pursuer. Teleport wasn’t just for running away, either. It was also great to catch up to people so you could finish them off. With the Patch 13 changes, Teleport was classified as a Defensive skill and bumped up to level 22. See the Wizard skill archive for more details on previous versions of Teleport and other Wizard skills. Or see Teleport (BlizzCon 2008) for the original version of this skill. In Diablo I, all classes with enough intellect could use the Teleport spell, albeit any class besides the Sorcerer did so with a much longer casting time, as with all spells. In Diablo II there was only one class capable of using Teleport without the use of the rune word Enigma, the Sorceress. This was due to Diablo II having individual skill trees rather than just a spellbook like in the original Diablo. Teleport used with a Striking Rune. Teleporting Wizard appears in mid-air. This page was last edited on 16 April 2015, at 17:40.